While the last teaser image from December showed partial front snout, the latest one gives a clear view of the rear side. Infiniti has finally released the first image of its new Q Inspiration Concept ahead of its debut at the 2018 North American International Auto Show in Detroit this month. The Japanese car-makers call the Q Inspiration Concept as "a new generation of vehicles that represents the first manifestation of Infiniti's new form language." While the last teaser image from December showed partial front snout, the latest one gives a clear view of the rear side. In August last year, Infiniti had showcased the Prototype 9, a sleek and open-wheeled electric retro-roadster prototype at the 2017 Pebble Beach Concours d'Elegance. From the teaser image, the new Infiniti Q Inspiration Concept has the look of a curvy large sedan with smooth body panels. Moreover, the elongated glass roof extends from the windscreen to the rear end of the window. 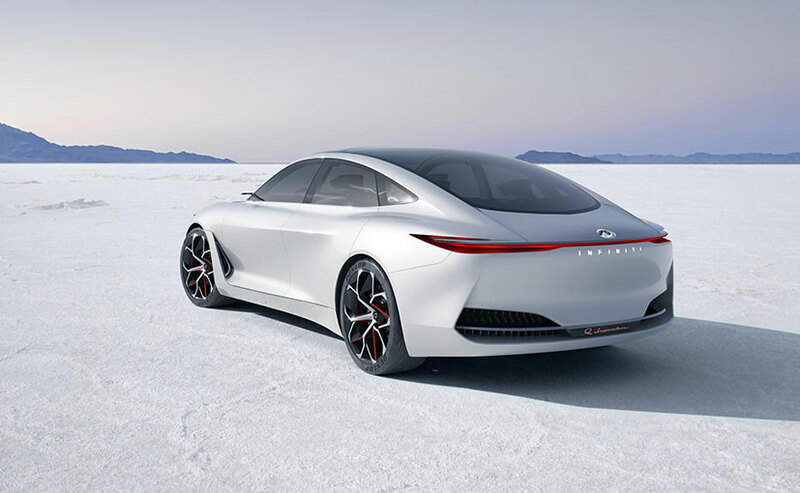 While, Infiniti has not revealed much about the new Q Inspiration Concept, we expect the design to be similar to the Audi A7 and the Porsche Panamera, with full width rear lighting and pronounced rear haunches. On the powertrain, we expect it to feature the all-new 2.0-litre VC-Turbo (Variable Compression Turbo) diesel engine, which was first shown at the 2016 Mondial de l'Automobile in Paris. Infiniti promises the new the four-cylinder VC-Turbo to be one of the most advanced internal combustion engines ever created.